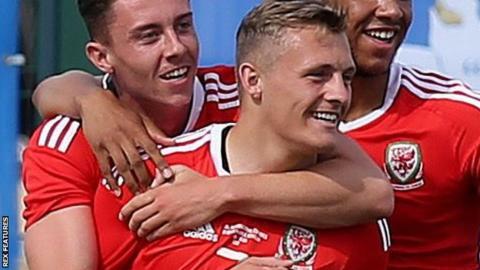 Two goals from George Thomas helped ease Wales Under-21 to victory away to Liechtenstein in their 2019 Uefa European Championship qualifier. The Leicester City striker struck twice before half-time at the Sportpark Eschen-Mauren, converting a penalty for his second score. Manchester City midfielder Matthew Smith added a third, although Ridvan Kardesoglu replied for the hosts. The result moves Wales into second in Group 8, a point behind Romania. Robert Page's side kicked off the campaign with a 3-0 victory over Switzerland on 1 September, before a 2-0 defeat against Portugal four days later. "It was a professional performance by the boys," Page said. "We were in a no-win situation, we were expected to just turn up and get the points. "But sometimes those type of games are hard... it was important that we got that first goal."